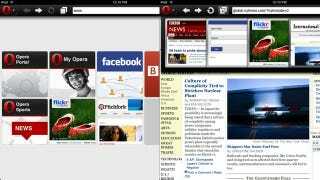 Opera Mini, the fast-ish browser previously available for the iPhone, has finally made its way to the iPad. The speed dial, 'tabbed browsing' and trademark zippiness of Opera Mini is all there. The official release, Opera Mini 6.0, has also been updated for the iPhone 4 and both versions (iPad and iPhone) have received a face lift. Sure there are a ton of capable web browsers for the iPad, but Opera Mini is a little better at compressing data than the others (that's important in these 3G data crunching days!). And like every other app made these days, there's easy sharing to Twitter and Facebook.